Life is But a Dream is the first book by Oasis non-executive director Chris Neligan. It is the exploration of the impact on her family of the death of their youngest child, Abigail Neligan, in 1984. 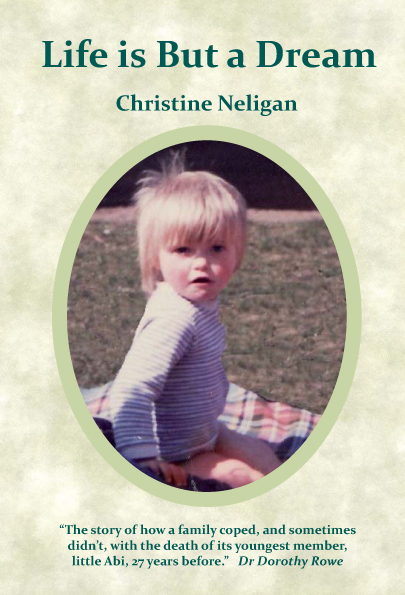 Chris interviewed each of the key members of the family and has recorded the transcripts of the interviews, along with her own observations, thoughts, wonderings and reflections. The passage of time led Chris to realise that bereavement can be a very isolating experience and that individuals had different memories of the events surrounding Abi’s death, as well as different ways of dealing with the feelings that arose. She wanted to ensure Abi would never be forgotten, that the range of experiences were recorded in an integrated form. Chris also realised that her family’s experience could perhaps help others. This is a powerful book with the inclusion of strong feelings and memories, but overall it is a celebration of a little girl’s life and the depth of love which helped the family to support one another and move forwards in their lives, both together and individually. Life is But a Dream is now available free – please read it and pass it on to someone else who might be interested. Contact us to get your copy. Chris’s hope that writing this book would be in part a tribute to Abi’s life is fulfilled as we read and discover that Abi’s life and death have had an enduring effect on the family, on their individual stories, on the family dynamic; the generosity with which her family share their memories and feelings with Chris – however conflicting and however private they have been till now; how over time Chris has been able to move through her own unendurable feelings of grief to immense compassion for all those affected by the tragedy. This isn’t a ‘how to’ book, but does provide all sorts of pointers to how those of us around could better support those in such a crisis. And an affirmation that talking is immensely healing – but can feel dangerous and does not have to happen in a hurry. These conversations took over 20 years to mature and are all the more fruitful for that. The book is a real account of the family’s grief and the different and similar ways in which the experience has altered the course of your life. The book offers a privileged insight into what is normally a very private process. I was able to identify strongly with two of the individuals through being a father, and also having a younger sister. This is a profoundly soul-searching, courageous human achievement. The description of Abi in hospital took me back instantly to how I felt after my daughter died, which I consider an achievement. I have read many books about bereavement and not all can re-create the feelings [in the way this book did]. I found the book brave and clean. The writing has a clear, simple honesty that is deeply engaging, particularly round such a confusing and complex situation and the reactions that arose from it. There must be many families who could find comfort in the pages of this book. The book reads so easily and yet deals with one of the most difficult of themes whilst all the time aware of the lovely little mischievous Abi in the background. Reading your book has endorsed that it is OK to be still grieving years on. The book has provided me with pieces of my own ‘jigsaw’ that previously appeared to be missing or mislaid. It is a truthful yet beautiful book. The book demonstrates so well how we never actually know what is going on for other people – however close – we make assumptions and so often they are wrong. Thank you for writing, sharing so much and exposing yourselves, but in a real way helping us to examine one of the biggest taboos in our society i.e. grieving and all it entails. You have made the unthinkable readable in crafting this remarkable book. In writing with such candour and integrity, you have challenged one of society’s enduring taboos. This book may help and inspire others to seek their own liberation from the isolating phase of the grieving process. I believe it has inherent power and potential to evoke and heal in the wider world. Reading this book made me remember my half-brother who died in World War 2. I thought about how his death affected me as a young girl and made comparisons. But we are all different, and your children’s reactions weren’t always as I might have expected. I couldn’t put the book down when I started it: beautifully written, very moving, and the style is a courageous and compelling format. You have launched your book which amongst other things nurtures a willingness and openness to pass thresholds and go through what is, not alone but in the company, courage and insight of others. This book is testament to love, to the human spirit and the willingness and desire to make sense of profoundly difficult circumstances. It taught me as much about life and living as it did about the immense impact of Abi’s death on the family.